You may know that Portland, Oregon, my hometown, is known as the City of Roses. We have several fabulous public gardens featuring these lovely flowers (come visit! ), and on just about any block of any street in any neighborhood, you’ll see wonderful roses in someone’s garden. Of course they’re gorgeous to look at. Of course they smell fabulous. But did you also know they are at the heart of many fascinating legends? I think it’s fun to know this stuff; it makes strolling through the gardens all the more intriguing. ♣ In ancient Rome it was common knowledge that any discussion held under a rose was to be kept secret, never repeated outside that room. Originally a rose was suspended over the table where people were seated; later, roses were carved into the ceiling of the meeting room. 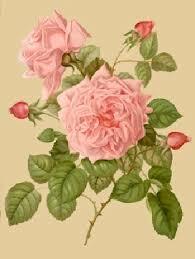 The Latin phrase “sub rosa,” meaning “under the rose,” is still used to describe a secret communication. ♣ The first time Marc Antony visited Cleopatra, she covered her floors with rose petals several inches deep, so that he would stir up the fragrance –and be stirred up in turn — as he walked toward her. ♣ In the early days of Christianity, rose petals were pulverized and mixed with water to make a paste, which was formed into beads and strung together as prayer beads. And that is why we call it a rosary. ♣ Roses are especially important in the language of flowers; each color has a different meaning, which was very useful to young lovers sending secret messages to each other. Red – I love you. White – We must keep our love a secret. Yellow – I love someone else. Pink – You are a graceful, tender beauty.